The sea anemones and the clown fish are well known to be a mutualistic pair and lot of research have been done about this pair of symbionts. We can also say that this relationship is a near perfect one in all aspects. Mutualism is an ecological interaction between two organisms in which both gain increased survivorship as a result of the interaction. The mutualism between the clown fish and the sea anemones is one such example. The 26 species of clown fishes from two genuses; 25 from the genus Amphiprion and 1 from the genus Premnas, are obligate symbionts of the 10 species of sea anemones which belong to two main genera Stichodactyla and Heteractis. Usually only fish of one species occurs within one actinian but there are also cases where 2 of them share a host which will usually be a large one with different territories for the 2 species. Clown fishes and sea anemones are under an obligate mutualism. This means that their range both ecologically and geographically does not really extend beyond their host. The stinging tentacles of the anemone protects the clown fish from the predator fishes. The clown fish is the only one which does not get stung by the tentacles since it has a mucus covering for protection. It was discovered that the clown fish do not really attach themselves to the tentacles but swim among them and huddle inside them for protection. Since the sea anemones pretty much fixated to the area they are in and are not very mobile, the clown fish helps to defend their territory and also eats the left overs from fish on the tentacles. The clown fish is provided with food by the anemone and in turn the clown fish give a better circulation of water to the anemones since they fan their fins while swimming about. The feces of the clown fish is also used as fertiliser by the anemone. 2) “Please use captive raised Clown Fish hosts” by Trevor. Anemones and Clown Fish, 7 Sep 2003. URL: http://www.garf.org/trever/anem/anenome.html (accessed on 16 Apr 2010). 3) “An exploration of the Clownfish” Author Unknown. Clownfish Biology, Oct 2005. URL: http://tolweb.org/treehouses/?treehouse_id=3390 (accessed on 16 Apr 2010). Figs can be parasites too! However, some fig species also engage in parasitism. One such example is the strangler fig, which includes Waringin (Ficus benjamina). This type of figs grows from a seed dropped on a tall host tree. From this seed, long roots grow and reach the ground. Then, they thicken and surround the whole tree. This eventually prevents the host tree from growth, thus “strangling” and killing it. This phenomenon has been examined in palm savannas in Venezuela (see study by Putz and Holbrook, 1989). In the following picture, we can see the roots of F. benjamina surrounding the trunk of another tree. I am amazed by how a single species can have different types of ecological interactions with other species. This reinforces the fact that ecosystems have complex relationships within and between them, and that everything is interlinked. As the song “Colours of the Wind” from Disney’s Pocohontas says, “We are all connected to each other in a circle, in a hoop that never ends”. Indeed, to successfully conserve these keystone species, we will need to have knowledge of all the different interactions that are occurring in the ecosystem. “Elisabethiella stuckenbergi females and males emerging from their galls inside a split open fig of Ficus thonningii,” by S. van Noort and J. Rasplus. Figweb, 2009. URL: http://www.figweb.org/Interaction/How_do_fig_wasps_pollinate/index.htm (accessed on 14 Apr 2010). “Ficus benjamina,” by Ria Tan. Wildfactsheets, 10 Mar 2008. URL: http://www.wildsingapore.com/wildfacts/plants/others/ficus/benjamina.htm (accessed on 13 Apr 2010). “Figs,” by Ria Tan. Wildfactsheets, 10 Mar 2008. URL: http://www.wildsingapore.com/wildfacts/plants/others/ficus/ficus.htm (accessed on 13 Apr 2010). “Figs and Fig Wasps,” by S. van Noort and J. Rasplus. Figweb, 2009. URL: www.figweb.org (accessed on 14 Apr 2010). “Fig tree covers rotting trunk of host tree,” by Friends of the Loxahatchee Refuge. Friends of the Arthur R. Marshall Loxahatchee National Wildlife Refuge, Jun 2009. URL: http://www.loxahatcheefriends.com/Nature/0906%20Jun/vines.htm (accessed on 14 Apr 2010). Putz, F. E. & Holbrook, N. M., 1989. Strangler Fig Rooting Habits and Nutrient Relations in the Llanos of Venezuela. American Journal of Botany, 76 (6): 781 – 788. “Waringin,” by Ria Tan. Wildfactsheets, 10 Mar 2008. URL: http://www.wildsingapore.com/wildfacts/plants/others/ficus/benjamina.htm (accessed on 13 Apr 2010). Whenever I tell someone I own 4 cats, I’m often met with a look of concealed surprise before they say, “Oh, well… that’s…umm…nice?” which not-so-secretly translates to “Oh my god, she’s one of those crazy cat-ladies!” After countless futile attempts at trying to defend my reputation, it got me thinking, why keep pets in the first place? What type of symbiosis exists between humans and their pets? Singaporeans may not be well-versed in the flora and fauna of Singapore, but we do love the idea of animals in the form of pets. Pets are popular in Singapore, the thriving pet shop industry being a testament to that. Stray animals, have also increased with abandoned animals being a majority of the animals the local SPCA takes in. (SPCA, 2009) People often take in animals, subconsciously expecting the relationship to be mutualisitic. What they fail to realise is that symbiosis between human and animals is never clear-cut mutualism, especially when it comes to cats. However, I believe, domesticated cats, Felis catus, especially in Singapore, often share a more commensalist symbiosis, with owners gaining no tangible benefit from the cat. * Cats can’t provide us food nor transportation and only offer the ecologically less tangible benefit of love and companionship (Archer, 1997). Singapore’s urbanised, compact environment, and strict government rules further enforce commensalism, as cats now depend on humans to even clean up after them. Because of this, owners often realise that cats take up too much of the time and energy, and then want out of the symbiosis. ailments regularly, resulting in their vet being able to take a luxurious holiday annually, and scratch me if they deem me in their way. You would expect them to at least be affectionate, but nope, they avoid me whenever possible. They only allow themselves to be petted when they’re sleeping, and never when they’re eating. And most of all, they get to choose where they sleep, and never give it up, especially when its on favourite chair. Commensalism? Sounds more to me like parasitism, at the expense of my bank balance, furniture and sanity! "in other words, i win!" *Disclaimer: This observation stems from 13 years of keeping cats, and from talking to other cat owners. This in no way reflects all symbiosis between humans and their pets. Cats are a different breed of pets, really. All photos of cats in this post were taken by me. Budiansky, S. The Covenant of the Wild: Why Animals Chose Domestication. New York: William Morrow, 1992. An inter-species relationship – when love is reciprocated. The parent’s shelter may not always be the best for the child. This may be the most apt description for the clownfish (anemonefish), whose true protectors in the coral reef ecosystems are the sea anemones instead of their parents (Roach, 2003). A mutualistic relationship is one where both partners of different species derive benefit from their interaction (Holbrook & Schmitt, 2005). Mutualism between the clownfish (Amphiprion sp.) and the sea anemones is one of the better-known examples of symbiosis that can be commonly seen on the southern shores of Singapore, such as on Kusu Island, Pulau Semakau and Sentosa. In general, what does each party stand to gain from the relationship? For the clownfish, protection from their predators is one of the main advantages. The tentacles of sea anemones have nematocysts that deter contact by most fishes and other invertebrates, while the mucus coating on the clownfish prevents the nematocysts from discharging its stingers (Holbrook & Schmitt, 2005). Thus, a safe haven is created for the clownfish when it seeks refuge within the tentacles of the sea anemone. An additional benefit is the provision of a safe nest site by the sea anemone (Holbrook & Schmitt, 2005). Leftovers of prey captured by the host sea anemone may also serve as a source of food for the clownfish (Tan, 2008). In return, the clownfish defends its host anemone from predators (Roach, 2003; Holbrook & Schmitt, 2005). The clownfish may also remove parasites, dead tissues and sediments from the anemone (Tan, 2008). In addition, there is the possibility that anemonefishes attract other fishes that are captured and eaten by the sea anemone (Tan, 2008). Sources of regenerated nitrogen, sulfur, and phosphorous can also be obtained if the sea anemone absorbs the wastes of the fish to gain additional nutritive benefits (Fautin, 1991; Holbrook & Schmitt, 2005). Life is indeed enjoyable when love is reciprocated after all. Fautin, D.G., (1991). The Anemonefish Symbiosis: What is Known and What is Not. Symbiosis 10: 23-46. Holbrook, S. J. & Schmitt, R. J., (2005). Growth, reproduction and survival of a tropical sea anemone(Actiniaria): benefits of hosting anemonefish. Coral Reefs 24: 67–73. Roach, J., (2003, June 5). No Nemo: Anemones, Not Parents, Protect Clownfish, National Geographic News. http://news.nationalgeographic.com/news/2003/06/0605_030605_findingnemofish.html, 14 April 2010. Tan, R., (2008). WILDFACT sheets – Anemonefishes, Amphiprion sp., Family Pomacentridae. http://www.wildsingapore.com/wildfacts/vertebrates/fish/pomacentridae/amphiprion.htm, 14 April 2010. “Tomato anemonefish; Pulau Semakau”, by Ria Tan. (August 2008). URL: http://www.wildsingapore.com/wildfacts/vertebrates/fish/pomacentridae/frenatus.htm (accessed on 14 April 2010). Many of us detest termites, as we think that they are the culprit behind the destruction of our wood furnitures. However, as what I have chanced upon through reading (for another module to be exact=p), termites should not be fully blamed for such “destructive nature”, as it is actually the protozoans living within them which are mainly responsible for the destruction. In other words, termites and protozaons share a mutualistic relationship with each other. Mutualism refers to the symbiotic associations between organims living in close nutritional relationships required by one or both members. Termites normally inhabit on wood, which is mainly made up of cellulose, the polysaccharide (composed of many sugar units linked by chemical bonds into a long chain) which gives plants their structural support. Most organims do not possess cellulase, the enzyme which digests cellulose. In this mutualistic relationship, termites chew up dead wood, and since they do not produce cellulase to digest it, they depend on their intestinal flagellate protozoans to complete the job. These protozoans produce enzymes which can break down the chewed wood into sugars, which can subsequently be absorbed into the termites’ gut. Therefore, termites cannot live without protozaons, as they are needed to process the wood pieces “chemically” so that both parties can use the sugar units as food source. Protozaons, as well, cannot live without (or outside of)termites because termites are needed to “mechanically” chew up the wood pieces before passing the baton of digestion to themselves! Hence both parties perform different different roles which will benefit each other. Therefore, mutualism is an important aspect of ecology as it shows the interaction between different species. So, do not just blame termites next time you see wood items being termites infested, blame the protozoans as well! Ever thought of something growing right beside your steps? This is noticed when I hopped down the slope at King Edward VII Hall in NUS. It is a mushroom. It seems that it is most probably under the Order Agaricales, Family Psathyrellaceae. During observation, the bunch of mushroom was among piles of dead leaves. After a few days, the mushroom started to die out and some cleaner came to ‘blow’ all the dead leaves away. On the ground, I could see nothing but soil and busy ants. Since it died naturally, I assumed there will be more ‘little’ mushroom shooting out soon. However, it didn’t happen. Here, we forgot about something, the micro-habitat (Molles, 2010). The habitat the mushroom grows in is a micro-habitat, but any changes to it, will actually decide its survival. The dead leaves were actually decomposing on the ground providing nutrient to the ground. This is the decomposed nutrient that is needed by fungus like mushroom that can’t undergo photosynthesis. The moment the leaves were blown away, not only does the mushroom loss its nutrient source, it has lost its protection and camouflage from the mushroom. Hence, it is not suitable for new generation of mushroom to grow on. Hence, from here, we could roughly draft the relationship between organisms in a microhabitat. Besides, the event of ant staying with the mushroom has strike my interest. I looked through some journals to understand that there is Ant-Fungus mutualism whereby Attini (such as leaf-cutter ants) will be responsible in nurturing and protecting fungus like mushroom from mould while mushroom provides a resting place for them (Nash, 2007). This is a symbiosis relationship between mushroom and ants but parasitism between ants and the tree, interesting huh? In this case, it is very hard to deduce whether the phenomenon I saw was on the same relationship due to insufficient observation data. Garling, L. (1979). Origin of Ant-Fungus Mutualism: A New Hypothesis. Biotropica , 284 – 291. Molles, M. C. (2010). Ecology: Concepts and Applications. New York: McGraw-Hill . Ulrich G. Mueller, T. R. (2001). The Origin of the Attine Ant-Fungus Mutualism. The Quarterly Review of Biology , 169 – 197. Cassiopea spp. and the case of undersea mutualism. Cassiopea sp., photographed personally on 27 Feb 2010 from the shores of Pulau Semakau, Singapore. Sea anemone? Soft coral? A dead jellyfish? An upside-down jellyfish? If your guess was the latter, you would be right. Cassiopea is a genus of jellyfish that live their lives standing on their heads. Why would they do that? Cassiopea spp. house thousands of photosynthetic zooxanthallae within their mesoglea (Berryman, n.d.). Zooxanthallae provide carbon for the jellyfish, and in return, the jellyfish provide the zooxanthallae with minerals, shelter (Tan, 2009) and presumably protection. Cassiopea spp. therefore live upside-down to allow their zooxanthallae companions access to sunlight. Also for this reason, Cassiopea spp. are found mainly in shallow marine waters – for example in the seagrass meadows of our very own Pulau Semakau (Tan, 2009). The symbiotic relationship between Cassiopea jellyfish and zooxanthallae is not dissimilar to the one between zooxanthallae and corals. Unlike with the corals however, the zooxanthallae do not provide for all of the carbon required by the jellyfish. Instead of being able to wait for food to be put on their figurative tables, the jellies do actually still need to feed themselves to an extent (Vodenichar, 1995), either through filter feeding, absorption of nutrients from the water, or by capturing prey with their nematocysts (Berryman, n.d.). Upside-down jellyfish do not stay put on the seafloor all of the time though! If disturbed, a swarm of upside-down jellyfish can launch upwards (Maui Ocean Center, n.d.). Cassiopea sp. swimming upright, photographed personally, on 28 Mar 2010, from the shores of Pulau Semakau, Singapore. Under normal circumstances however, these jellyfish prefer to be upside-down, and if you try to flip them over, they will slowly turn themselves upside-down again (Tan, 2009)! Cassiopea sp. turning itself ‘the right way up’, photographed personally, on 28 Mar 2010, from the shores of Pulau Semakau, Singapore. Sometimes, Cassiopea spp. may be carried on the backs of urchin crabs (Dorippe frascone) for defense against their predators. It seems like it’s mutualism with a dash of an exploitative interaction thrown into the mix, here. Which makes the ecological interactions in Nature all the more fascinating. Second source: Holland, B. S., et al., 2004. Global phylogeography of Cassiopea (Scyphozoa: Rhizostomeae): molecular evidence for cryptic species and multiple invasions of the Hawaiian Islands. Marine Biology, 145(6): 1119-1128. “Upside-down Jellyfish,” by Matt Berryman. Marine Invertebrates of Bermuda, n.d.. URL: http://www.thecephalopodpage.org/MarineInvertebrateZoology/Cassiopeaxamachana.html (accessed on 14 April 2010). “Upside-down Jellyfish,” Maui Ocean Center Marine Life Profile. Maui Ocean Center, The Hawaiian Aquarium, n.d. URL: http://www.mauioceancenter.com/marinepdf/upside-down_jellyfish.pdf (accessed on 14 April 2010). “Upsidedown jellyfish,” by Ria Tan. Wild Factsheets, March 2009. URL: http://www.wildsingapore.com/wildfacts/cnidaria/others/jellyfish/upsidedown.htm (accessed on 14 April 2010). Vodenichar, J.S., 1995. Ecological physiology of the scyphozoan Cassiopea xamachana. M.S. Thesis, University of Georgia, Athens, USA. Look closely, the caterpillar isn’t dead. Caterpillar (to ant): Hey, let’s make a deal. If I supply you with food, will you give me protection against predators? Studies have shown that certain species of butterfly larvae (in particular Family Lycaenidae) are involved in food-for-protection mutualistic relationships with ants. This is termed myrmecophily, or the positive interspecies association between ants and butterflies. (Khew SK, 2010). How does it work? Many lycaenid caterpillars possess a suite of anatomical structures for maintaining relations with ants. Nutritious secretions produced by certain lycaenid caterpillars are consumed by particular ants, which then protect the caterpillars from parasitism and predators (Pierce, 2002). Because caterpillars do not automatically pass honeydew, they must be stimulated to secrete droplets and do so in response to ant antennation (the drumming or stroking of the caterpillar’s body by the ants’ antennae) (Fiedler et al., 1996). Some caterpillars possess specialized receptors that allow them to distinguish between ant antennation and contact from predators and parasites, and others produce acoustic signals that agitate ants, making them more active and likely better defenders of the larvae (Fiedler, 1991). The enemy-free space that ants can provide for lycaenids is significant: one experiment conducted by Pierce and colleagues in Colorado demonstrated that survival rates of G. lygdymus larvae declined 85-90% when ant partners were excluded (Fraser et al., 2001). However, ant-tended individuals were observed to reach smaller adult sizes than non-tended individuals due to the costs of appeasing ants during the larval stage (Pierce et al., 2002). Adult females of many lycaenid butterflies also preferentially oviposit on plants where ant partners are present, possibly by using ants’ own chemical cues to locate sites where offspring will likely be tended by ants (Fiedler, 1991). Finally, while most widely documented in Lycaenid butterflies, many other lepidopteran species are known to associate with ants, including moths. Fiedler K, Holldobler B. & Seufert P., 1996. “Butterflies and ants: The communicative domain,”. Cellular and molecular life sciences, vol. 52, 1996, pp. 14-24. Fiedler K., 1991. Systematic, evolutionary, and ecological implication of myrmecophily withing the Lycaenidae. UND Museum Alexander Koenig: Bonner Zoologische Monographien. Fraser A. M., Axen A. H., and Pierce N. E., 2001. “Assessing the Quality of Different Ant Species as Partners of a Myrmecophilous Butterfly,” Oecologia, vol. 129, Nov. 2001, pp. 452-460. Pierce N.E., Braby M. F., Heath A., Lohman D. J., Mathew J., Rand D. B., and Travassos M. A., 2002. “The ecology and evolution of ant association in the Lycaenidae (Lepidoptera),” Annual Review of Entomology, vol. 47, 2002, pp. 733-771. “DSC04241,” by Henry Koh. Flickr, 8 June 2008. URL: http://www.flickr.com/photos/henrykoh/2560311167/ (accessed on 14 Apr 2010). “A Quiet Afternoon @ MNT Boardwalk,” by Frederick Ho. Beauty of Fauna and Flora in Nature, 15 Jan 2010. URL: http://peacockroyal.blogspot.com/search?updated-max=2010-02-20T21:05:00%2B08:00&max-results=8&reverse-paginate=true (accessed on 14 Apr 2010). Gobies (Istigobius sp.) and snapping shrimps (Alpheus sp.) are marine organisms common to the Singapore waters and one location where they can be spotted easily would be Labrador Rocky Shore. The two organisms form a unique and symbiotic relationship known as mutualism where both parties benefit from the positive interactions with each other. Snapping shrimps are scavengers and are known to burrow into the substrate of the marine environment in search of food (Foster & Smith, 2010). At the same time, they work to maintain the walls of the burrows which essentially serve as their home (Curran-Ragan, 2010). The amount of work to be done, coupled with the shrimp’s bad eyesight, cause them to be susceptible to predators, especially in lagoons and reef edges where there is little cover. To protect itself, the shrimp pairs with the goby and uses it as an ‘early warning system’ (Curran-Ragan, 2010). The goby hovers at the entrance of the shrimp’s burrow and interacts with other gobies, all the while maintaining contact between its tail and the shrimp’s antennae. When it senses danger, the goby flicks its tail and alerts the shrimp, giving it time to sit still or retreat back into the burrow in time. Research has shown that many forms of signals are present and they all translate to different actions undertaken by the shrimp (Preston, 1978). The goby also benefits from this pairing by utilizing the ready-made burrow created by the snapping shrimp. After an entire day of work, both organisms will retreat into the burrow to rest (Preston, 1978). It has also been observed that snapping shrimps were seldom seen without their goby counterparts (Preston, 1978) and when such scenarios do arise, the mortality rate of the shrimps become very high (Thompsom, 2004). This may be due to the snapping shrimps emerging less from their burrows for fear of predators. By burrowing less, they derive lesser food and nutrition and also subject their burrows to a greater risk of collapsing. Have you ever noticed and wondered why Coral Reefs out skirting the southern islands of Singapore appear to be in various colours? This is due to the presence of Mutualistic Relationship between the Reef-building hard corals (Order Scleractinia) and the Zooxanthellae, Symbiodinium spp. These microscopic single cell algae live within the corals’ polyp tissues and are responsible for its colourations (WildSingapore, 2008). These marine species are metabolically interdependent and both benefits from the symbiosis. Corals have the inability to generate sufficient foods for survival (Megan, 2009). By having zooxanthellae living in its cell tissues, these photosynthetic algae help to make foods for the corals polyps. The carbohydrates made are used by the polyp as nutrient for growth (e.g. to build their calcium carbonate skeletons) and the oxygen for respiration. Carbon dioxide in return cycled back to the zooxanthellae. In the process, carbon dioxide are removed. This is important for polyp calcification under optimum conditions, thus accounting for the many coral reefs observed in Singapore. Also, nitrogen and phosphorus are cycled. Zooxanthellae take in ammonia as nutrient given off as waste by the polyp, and return amino acids back for its growth (Megan,2009). This thus provides a nutrient rich environment for excellent growth for both. However, this mutualism can be upset by environmental stresses. Unusually warm or cool water temperatures, a change in salinity or excessive exposure to sunlight or shading or human activities (e.g. sedimentation or land reclamation) can lead to expulsion of the zooxanthellae by the corals (WildSingapore, 2008). This is known as Coral Bleaching. It is thus strongly believed that more should be done to protect these Coral Reefs in Singapore, both fiscal and public. Corals have already many a time experience threats, losing their “beautiful” colouration and some even die locally. Are you ready to let this happen again and bear the consequences of the possible complete extinction? White & Fluffy, Sweet but Deadly? A few weeks ago, I was surprised to find that my Watermelon Begonia, Pellonia repens, had some white clumpy patches growing on the underside of its leaves. It looked quite disgusting, and I thought it was a fungal infection. So I posted some pictures of them on Facebook, and my friend said it may be mealybugs. Curious, I searched for more information. Mealybugs (Family Margarodidae) are unarmoured scale insects that produce fine powdery wax in long lateral filaments on its body surface (Cox & Pearce, 1983). They are common crop pests that are usually found in dense colonies. The wingless females use sucking mouthparts to feed on plant sap while males don’t feed. As mealybugs have little or no mobility, the newly hatched nymphs are dispersed by winds (Lim, Murphy, Morgany, Sivasothi, Peter K. L. Ng, Soong, Tan, Tan & Tan, 2001). Stains after removal from the plant. Mealybugs are considered as a parasite for most plants, but for some they may be beneficial as they function as extrafloral nectaries due to their honeydew secretions. These would attract ant colonies that protect the plant from herbivores. Likewise, the mealybugs are protected from predators too as the ants tend the mealybugs for their sweet honeydew secretion (Rico-Gray & Thien, 1989). Not unlike humans and their cows, you could say! Ants farm mealybugs for their honeydew! A point of interest would be mealybugs are both parasites and mutualists, and I guess not many organisms can claim that title! Cox JM, Pearce MJ. 1983. Wax produced by dermal pores in three species of mealybug (Homoptera : Pseudococcidae). International Journal of Insect Morphology and Embryology 12: 235-248. Lim KKP, Murphy DH, Morgany T, Sivasothi N, Peter K. L. Ng, Soong BC, Tan HTW, Tan KS, Tan TK. 2001. Volume 1: The Ecosystem and Plant Diversity and Volume 2: Animal Diversity. In: Ng PKL and Sivasothi N, eds. A Guide to Mangroves of Singapore. Singapore: Singapore Science Centre. Rico-Gray V, Thien LB. 1989. 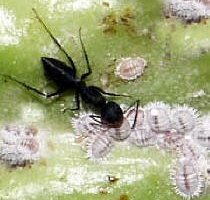 Ant-Mealybug Interaction Decreases Reproductive Fitness of Schomburgkia tibicinis (Orchidaceae) in Mexico. Journal of Tropical Ecology 5: 109-112. “mealybug.”, by The Columbia Encyclopedia, Sixth Edition. 2008. URL: http://www.encyclopedia.com/doc/1E1-mealybug.html (Accessed Apr 14 2010). Bats, not as bad as you think. To many, bats are dirty, scary and mysterious while to the fruit farmers, fruit bats are persecuted as pests for the damage they do to their yield. All of these have rendered bats to be among the most hated and most feared animals in the world, hiding under a bushel the importance of fruit bat as a seed-dispersal agent. The most commonly found fruit bat in Singapore is the Lesser Short-nosed Fruit Bat, Cynopterus brachyotis (Phua, P.B. and Corlett, R.T., 1989). Bearing a dog-like face with large eyes, it is also widely known as the Lesser Dog-faced Fruit Bat (Wild Fact Sheets, 2008). In Singapore, you can find them almost anywhere, ranging from coastal areas, forests, riverside to urban areas (Phua, P.B. and Corlett, R.T., 1989). According to Phua and Corlett (1989), the Lesser Short-nosed Fruit Bat (Cynopterus brachyotis) is a very important seed-dispersal agent for the Tiup-tiup (Adinandra dumosa), which is the dominant species in the secondary forest adjoining to National University of Singapore (NUS) (Phua, P.B. and Corlett, R.T., 1989). With Tiup-tiup (Adinandra dumosa), the Lesser Short-nosed Fruit Bat (Cynopterus brachyotis) establish a mutualistic relationship. Though A. dumosa fruits all year round but its conspicuous green-hue fruits surprisingly, are not taken by birds or other mammals, but by the C. brachyotis ( Phua, P.B. and Corlett, R.T., 1989). The habit of Lesser C. brachyotis to defecate during its flight has greatly enhanced the dispersal of Tiup-tiup (A. dumosa) seeds to a wide range of habitat. Being the major food source, the Tiup-tiup (A. dumosa) thus maintains high population density of Fruit Bat (C. brachyotis) in the secondary forest (Phua, P.B. and Corlett, R.T., 1989). One question raised here is why C. brachyotis the sole diepersing agent for A. dumosa. Phua and Corlett (1989) provide an explanation that A. dumosa has evolved over time in favor to be dispersed by the fruit bats. However, the mechanism underlying the evolution is not established. This calls for the study of natural history of both the bats and plants in the university’s secondary forest to explain this specific mutualism. Phua, P.B. & Corlett, R.T., 1989. Seed Dispersal by the Lesser Short-nosed Fruit Bat (Cynopterus brachyotis, Pteropodidae, Megachiroptera). Malayan Nature Journal, 42: 251-256. If you don’t get your end of the deal, get even. Pollination, which is a term for sexual reproduction process in plants, is a common and ubiquitous form of mutualism between flowers and their pollinators. According to Poole (2004), the use of a pollinator can be much more exact if the plant species can attract a pollinator, attach its pollen to it, and then get the pollinator to go to another individual of the same plant species. This is especially true for figs and their pollinators, fig wasps, which are interdependent on each other for propagation. Their relation is strictly specific – each fig species has its own associated species of pollinator wasp which co-evolved with it (Wiebes, 1979). This type of mutualism can be seen in Kent Ridge Park, behind NUS campus. The most common fig found there is Ficus grossularioides, also known as the White-leaved fig. Other species such as Ficus fistulosa, Ficus fulva and Ficus microcarpa can also be found growing at the edges of the Park (Tan et al, 2002). White-leaved fig which shows green unripe figs with some yellow orange ripe figs on fruiting branch. Photo taken from Tan et al, 2003. How this mutualistic relationship works: The figs, Ficus spp., offer protection for the safe development of the wasp larvae after fig wasps lay their eggs inside the fruit. In return, the wasps pollinate the figs (Kelly, 2010). In the figs, the wasps mate after hatching and the males die while the females squeeze out of the fig to lay their eggs, and in the process pick up pollen (Seah, 2004). The fig ripens once the female fig wasps have left the fig, changing colour and smell which becomes attractive to seed or fruit-eating birds, bats, and monkeys (Noort, 2009). Female fig wasps deposit the pollen they carry when they enter other figs to lay their eggs, thus pollinating the figs. A female fig wasp laying eggs in a split open fig. Photo taken by Simon van Noort, 2009. Females and males emerging from their galls in a split open fig. Photo taken by Simon van Noort, 2009. However, if a wasp lays its eggs but fails to pollinate the fig, the trees will drop those figs to the ground, killing the baby wasps inside. A learning point to take away from nature: If you can’t get your end of the deal, get even. Weaver Ants: Friend or Foe? Often, concepts and lessons taught in class are thought to be something observed in the laboratory or in some jungle where students will never go. Yet a trip to one’s own backyard or park proves otherwise. While taking a walk in a park (literally), a trail of Weaver Ants (Oecophylla smaragdina) on a tree trunk caught my eye. A trail of weaver ants on a tree trunk which caught my eye. On further inspection, I noticed that the leaves on the tree were covered with holes but no animal was found to be feeding on the leaves. An interesting thing I observed was that holes were observed on only one particular species of trees and only on the mature leaves. This is unusual as weaver ants were known to protect the host tree from herbivory to the extent that they are used as pest control in crops (Peng & Christian, 2004). This ant-plant interaction is known as myrmecophily a form of mutualism. The plant host, known as myrcophytes, often provides shelter (or the building materials, leaves in this case) or food for the ants, which in turn protect plant from herbivores. A weaver ants' nest, observe how the leaves are folded to form a pocket to house the ants. As it turns out, ants have inter-species relationships with other animals such as homopterans and lycaenid butterflies (Family: Lycaenidae) (Tsuji at el, 2004). As homopterans adapted to feeding on plant fluids, they are not likely to cause these holes. Peng, R. K. & Christian, K. (2004) The weaver ant, Oecophylla smaragdina (Hymenoptera: Formicidae), an effective biological control agent of the red-banded thrips, Selenothrips rubrocinctus (Thysanoptera: Thripidae) in mango crops in the Northern Territory of Australia. International Journal of Pest Management, 50(2): 107-114. Images: All pictures were taken with a Canon PowerShot A1000 IS camera.